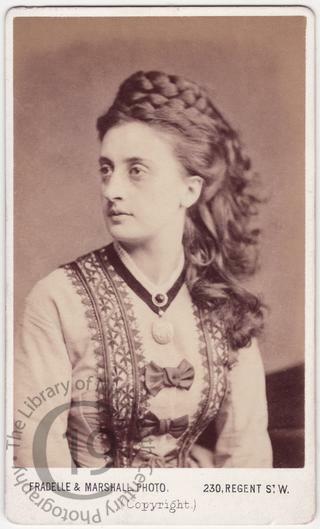 A carte-de-visite portrait of the actress Mrs Scott Siddons. Mary Frances Scott Siddons (1844-1895) was a member of the great acting dynasty established by Roger Kemble in the eighteenth century and the great-granddaughter of the famous actress of the Regency period, Sarah Siddons. She was born in India, where he father served as a captain, and made her professional debut at Nottingham as Lady Macbeth. She first appeared in London in 1867 as Rosalind in As You Like It at the Haymarket Theatre. Her American debut was at the Boston Museum and her New York debut at the Worrell Sisters’ Theatre in 1868. She joined Augustin Daly’s company in New York in 1869. Mrs Scott Siddons died in London on 30 December 1895. Photographed by Fradelle and Marshall of London.